A serious real-life story of vicious assault and creative mental rehabilitation gets a Hollywood gloss courtesy of ‘Forrest Gump’ director Robert Zemeckis. In 2000, small-town artist Mark Hogancamp was assaulted by a group of men he’d been drinking with after they learned he was a cross-dresser, and beaten so badly he lost his memory. As a form of self-therapy, Hogancamp built a fictional scale-model Belgian town in his backyard and populated it with action figures representing World War II-era avatars of himself; also represented were his attackers (as Nazis) and assorted women (his protector-saviors). 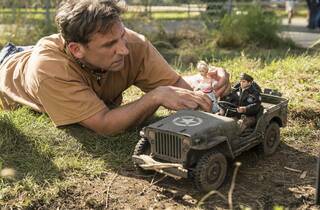 It’s a fascinating story, told in the much-acclaimed 2010 documentary ‘Marwencol’, one that ‘Welcome to Marwen’ attempts to turn into a feel-good Hollywood movie, with mixed-to-excruciating results. From the jaunty opening notes of Alan Silvestri’s score, it’s clear that writer-director Robert Zemeckis (working with co-scripter Caroline Thompson) will be emphasising the triumph-of-the-human-spirit side of Hogancamp’s account. In that respect, Steve Carell’s sympathetic reading of the troubled protagonist is an asset: He’s believable as someone who would devote himself to creating and photographing detailed set pieces while pining for a pretty new neighbor (Leslie Mann). Just as often, though, Zemeckis presents him as his miniature alter ego, Cap’n Hogie, in digitally generated sequences that bring Hogie and his fellow dolls to life in exaggerated combat situations. Meant to dramatise Hogancamp’s inner life, these fantasies are technically well-realised but jar against the scenes of Hogancamp’s real life. Moreover, the presentation of some of them as nightmares misframes them as sources of his trauma, rather than his way of working through it. They also occasionally make distracting use of pop-cultural references: The girls stride into battle to the backing of Robert Palmer’s ‘Addicted to Love’ and, toward the end, there’s a particularly ill-fitting homage to Zemeckis’s own ‘Back to the Future’. 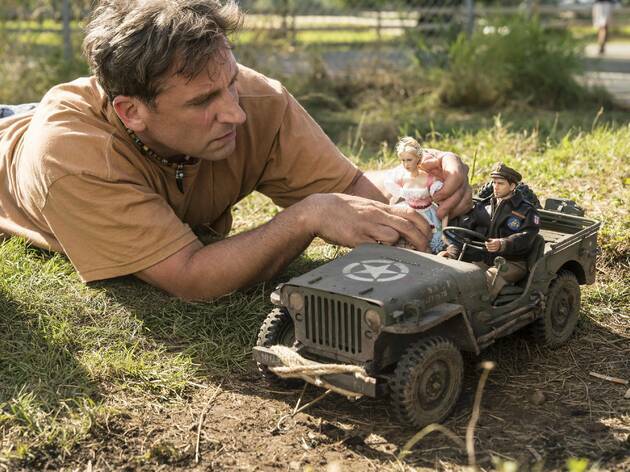 In turning this real-life story into a special-effects showcase, ‘Welcome to Marwen’ winds up negating its drama and softening its real people. While the film acknowledges Hogancamp’s proclivity for wearing women’s shoes (while also feeling the need to assure us that he ‘likes dames’), it supplies little in the way of inner life to the actual women around its hero, and dances around the severity of the attack that mentally disabled him. A closing credit noting that Hogancamp hasn’t touched alcohol since the assault – when the issue of his prior alcoholism isn’t addressed – summarises the disconnect between the story this film tells and the way it tells it.